The Save As command of Microsoft Excel 2016 can be presence in the left section of the Excel 2016 backstage view, which is accessible by selecting the File tab in the ribbon. 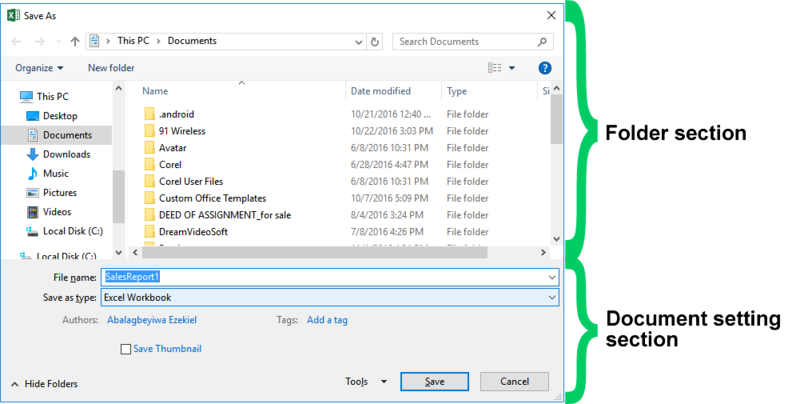 The Save As command is used when you want to save your workbook for the first time or when you want the changes you made not to affect the previously saved workbook, then you can use the Save As command to save it again to another file. These are the two basic function of the Save As command of MS Excel 2016, but is not the only function. Thus, I want to use this post to walk you through almost all the component to the Save As dialog box you that you can also learn of the different things the Save As command can do. The above image is a typical example of how the Save As dialog box of Excel 2016 look like. The box is divided it two section which is the Folder section and the Document setting section. The folder section is where you have choose which folder you want the workbook to be save in. and depending on the theme and the OS of your computer, the folder section might look differently as the one above. The Document setting section looks the same on any computer regardless of the computer's OS. The File name: field is used to specify the name of the workbook. 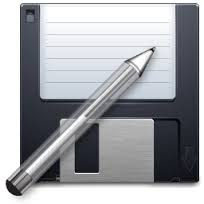 The Save as type: option list is used to save the workbook in an appreciate file format for future use. For example, the default file format for workbook created in the Excel 2016 is .Xls and Excel workbook save as type option you need to select so as to save the workbook in that format. Whereas, if you want the workbook to be saved as a Comma Separated Value (CSV) file, then you need to change the save as type option to CSV (comma delimited). The Author: area is used to specify which person's name should appear as the author or creator of the workbook in the workbook detail. By default, the name of Of the person (Not the name of the computer) that was used to register the computer's OS is what will appear there. Clicking on the name will enable you to change it. The Tag option is used to add a label to the workbook, which will serve as an aid in case you want to rearrange the workbooks in your computer in the future. Map Network Drive: for creating a connection to a drive which you used to store your files but excel is not installed in that drive, or to connect to a cloud service. Web Options: this option is used to control various features and settings for Web pages that you created with or import to Microsoft Office Excel 2016. For example, you can use to option to specify which version of browser can be used to option the file, and more. General Options: this one enable you to password protect the workbook so that unauthorized person will not be able to view and/or edit the workbook. Compress Pictures: option is used to compress all the pictures in the workbook at a time before saving, so as to reduce the file size of the workbook, or for any other reason you might have for wanting to reduce it. The Save button is used when you have finally decided to save the workbook. While the Cancel button as the name implies, is used to close the Save As dialog box without saving the workbook. These are the basically the things, the Save As dialog box of MS Excel 2016 is design to do.